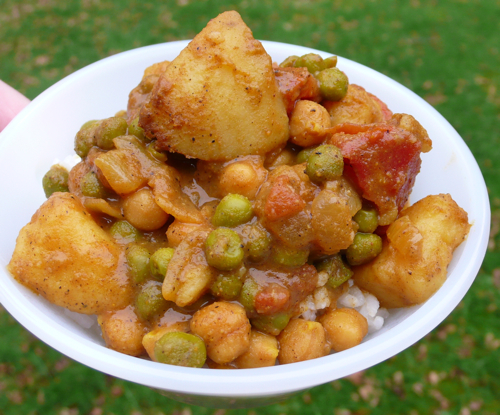 I took a couple of recipes and combined them to come up with a vegan curry that wasn’t creamy. The problem with creamy is coconut milk is usually called for, instead I used lower sodium vegetable broth. A lot more heart healthy that way and considerably less fat. Put the potatoes in a large saucepan and cover with cold water. Bring to a boil, turn to medium-low and let simmer for about 15 minutes or until just tender (fork test). Drain in a colander and let dry for a few minutes. Meanwhile in a large non-stick skillet heat the oil over medium. Add in the onion and cook till translucent. Add in the spices and stirring often let cook for a couple of minutes. Add in the tomatoes, garbanzo beans and vegetable broth, stirring well. Stir in the peas and potatoes. Bring to a simmer and then let gently simmer covered for 10 to 15 minutes, stirring often. Add salt to taste and cayenne pepper for heat as desired. Serve over freshly cooked rice with Naan bread on the side. Serves 4 to 6 easily. This is a very nice dinner and very similar to curries I have done in the past and one I am planning to have in the next week or so. I like the sound of this. I am always looking for ways to cut back on meat (although I doubt I’ll ever give it up entirely). I love the ingredients. I haven’t had a decent curry in awhile, so I may have to try this one.